New Delhi: The National Capital Region woke up to a chilly and misty morning with the minimum temperature dipping to 5 degrees Celsius, which the meteorological department said, was two notches below the season's average. Severe cold wave is expected to continue for the next three days over Delhi, Chandigarh, Punjab and Haryana. The weather office warned that there will be no letup in foggy conditions and ground frost as well in North West India and western Uttar Pradesh. The capital is expected to see clear sky today. The day temperature is expected to be around 21 degrees Celsius. Fog badly affected the movement of trains in north India as visibility was poor. At 8.30 am, the Palam recorded a visibility of 400 metres while it was 800 metres at Safdarjung. 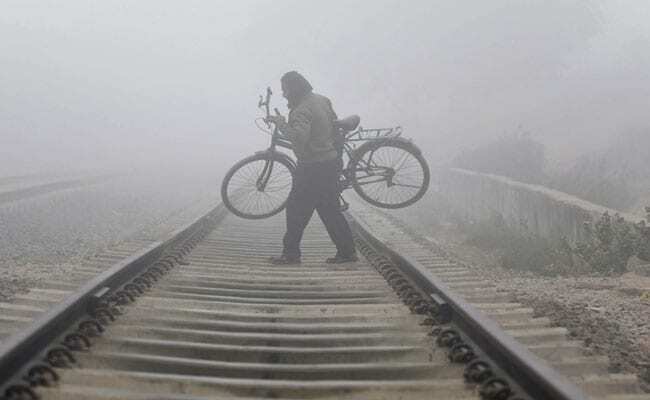 At least 18 trains were cancelled and 50 delayed due to fog in several parts of northern India. Officials of the Northern Railways and North-Eastern Railways said passengers waiting in railway stations will get all possible facilities. Most parts of northern India are in the grip of intense cold wave with sweeping icy winds. Reports say in the last 24 hours 12 people have died and over 80 in last one week in Uttar Pradesh. According to IANS, 22 deaths have been reported from Poorvanchal; 3 each in Brij, and Bareilly, 11 in Allahabad and 28 in Bundelkhand. Lucknow was the second coldest place in Uttar Pradesh on Sunday, at 2.6 degrees while Bahraich was at 2.4 degrees Celsius. The meteorological department has warned that the mercury will plummet further; two degrees lower than normal in Lucknow and surrounding areas. In Uttar Pradesh, schools at many places opened today but the administration has ordered the timing of the schools to be changed to 10 am. for all classes. In Rajasthan, there was some respite, with minimum temperatures at most places rising by by 1 to 2 degrees Celsius. Alwar was the coldest district with a low of 1.2 degrees Celsius.